Ratatouille – Did You See That One? 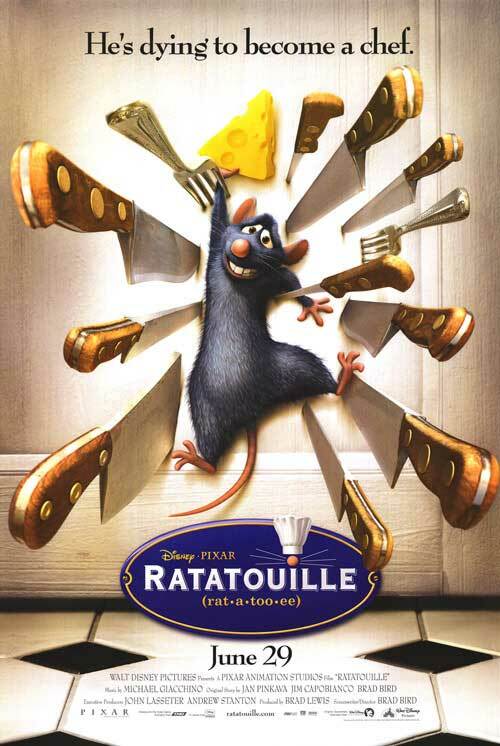 Remy (Oswalt) is a rat who knows his way around the kitchen. Linguini (Romano) is a young man stumbling through his first job in a restaurant. When the two connect, they form a unique alliance in the hopes that they can both achieve their dreams. This is a fun film from the people at Disney, directed by Brad Bird (The Incredibles) and Jan Pinkava (Monster’s Inc.). The story came from a team of writers that included Bird, Pinkava, and Jim Capobianco (The Lion King). The cast of voice actors includes Patton Oswalt (Magnolia), Lou Romano (Up), Peter O’Toole (The Last Emperor), and Ian Holm (The Hobbit: An Unexpected Journey). Brian Dennehy (Romeo + Juliet), Will Arnett (The Lego Movie), and John Ratzenberger (Brave) also lent their voices to this one. The team that wrote this story brought together memorable characters into a somewhat new setting for an animated film. With the culinary world all around them, Remy and Linguini seem to go through similar coming-of-age moments. They’re also up against a couple great antagonists. The story is fun and entertaining from the start, and never seems to slow or lose the comedic elements. This might be one of the more overlooked of Disney’s great animated features. For their work, Bird, Pinkava, and Capobianco were nominated for an Oscar for Best Original Screenplay. The voice acting in this movie is really awesome. I love Patton Oswalt and this character seems perfect for him. He’s able to handle the more sentimental moments as well as he handles the comedy. Lou Romano also does great work with his character. Ian Holm and John Ratzenberger also do nice work with their parts in this film. My favorite performance comes from the legendary Peter O’Toole. His voice work for Anton Ego is wonderful. This might be a bit of sentimentality on my part, but I think it really adds something to this film. In addition to the voice work, this movie looks really good. The animation does a wonderful job bringing a whimsical version of France to life. The stylized world of the film feels right for the story, and also captures some of the realities of a working kitchen. The attention to detail definitely stands out in this one. The characters are also designed nicely, making them memorable and fun. It’s no wonder that this won the Oscar for Best Animated Feature. In addition to the win and nomination mentioned above, this film was nominated for three additional Oscars. The film’s score, by Michael Giacchino (Up), was nominated for Best Original Score. The film was also nominated for Best Sound Mixing and Best Sound Editing. Despite losing in each category, they’re all well-deserved nominations for a really good movie. This Disney-Pixar collaboration holds up really well. This is definitely one for fans of Disney or Pixar. I would also recommend this one to fans of the actors who voiced the characters. If you’re a fan of animation make sure to check this one out. If you’ve seen it before, maybe it’s time to revisit it. The story is fun, and the characters are memorable. I give this one 4.5 out of 5 stars. Pingback: Inside Out | Did You See That One? Pingback: The Iron Giant – Did You See That One?